This lovely piece features a triad of diamonds that are meant to represent a three-person family, three children in the home, or the simple luxury of owning such a gorgeous gold and multi-diamond pendant. This Three Stone Diamond Heart Pendant in 10K Yellow Gold is an easy choice to make because it is sure to please any woman who loves the finer things in life. 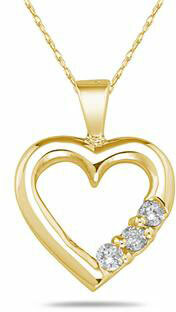 The necklace features a 10K yellow gold pendant in the shape of a heart. The placement of the three round-cut diamonds (0.15 t.c.w.) on the bottom right-hand side of the heart gives an interesting visual element to the piece. The gold is buffed to a beautiful high polish that lets the shadows and light dance on the surface of the gold, which also enhances the shimmer of the diamonds. A simple gold bale attaches at the top of the heart. A lovely keepsake, this gold and diamond pendant is easy to wear and match with outfits, as nothing can be more appealing to a woman than gold and diamonds. Pendant comes with an 18 inch white gold chain. We guarantee our Three Stone Diamond Heart Pendant in 10K Yellow Gold to be high quality, authentic jewelry, as described above.